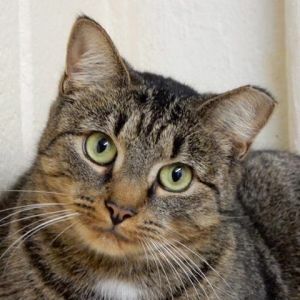 Hi, my name is AUDREY and I am a 3 year old BROWN TABBY girl with a cute white patch of fur on my chest and PRETTY green eyes. No doubt you noticed my one tipped ear, but they say that just gives me character. Posh Pets rescued me from a terrible hoarder situation. Although this experience has left me a bit cautious towards humans, I’m beginning to get more COMFORTABLE and I seek ATTENTION and I really like to be PET. I am AWESOME with other CATS and I like their COMPANIONSHIP. That being said, I would really thrive in a home with another cat, preferably a calm, quiet home or I could be your one and only. So if you are a patient person and willing to take a chance on me, your gamble will be well worth it. Let’s meet and see if we have chemistry. I am spayed, UTD on shots, and FIV/FeLV negative.